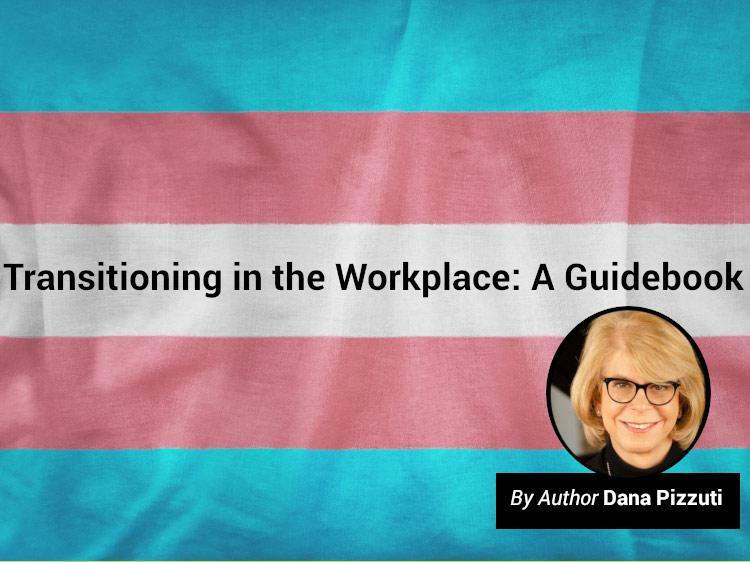 As a pharmaceutical executive, Dana Pizzuti, author of ‘Transitioning at Work,’ shares what transgender people—and their colleagues and employers—need to know about gender transition at work. Dana Pizzuti tells what it's like being transgender at work. While the Human Rights Campaign Foundation recognizes a number of outstanding companies for lesbian, gay, bisexual, and transgender (LGBT) equality, there are still many companies out there with little-to-no stated policies to help employees navigate the complex before-and-after experiences of gender transition. So, in 2015, she began her transition. At the time, she was a vice president at a Fortune 100 pharmaceutical firm, where she grew her department from 120 to 400 people in 30 countries during her eight-year tenure. But, as she began to wear nail polish and earrings to the office, she says her employer began to discriminate against her change in appearance. Pizzuti has become an advocate for the transgender community, with her book serving as a comprehensive guide to the psychological, medical, legal, social, and professional aspects of expressing one’s true gender. Monster recently spoke with Pizzuti about what transgender people—as well as their colleagues and employers—need to know about workplace discrimination. Q. Your book offers transgender readers a series of checklists to help decide whether—and when—to transition. What are some of the career factors here? A. It’s sad that, because of worries about how co-workers and employers will react, many transgender people never transition at all. But the decision to do so, or not, depends on several factors that are highly individual. For one thing, some industries and jobs—fields like pharmaceuticals and sales—are much more conservative than others, so you’re likely to face more resistance, and you need to mentally prepare yourself for that. In addition, the decision depends partly on what state or region you live in. Some parts of the country are far more progressive than others. Are you able to move, if necessary? Another consideration is timing. Would you be most comfortable taking some time off to transition, and then starting a different job as your new self? All of these things vary so much from one person to another that there is no one-size-fits-all answer. The good news is, more and more companies in every industry and every state are becoming more welcoming and more genuinely inclusive. Q. Let’s say someone decides, as you did, to transition while staying in their current job. How do you explain it to co-workers? A. The language you use is important because it sets the tone for how people will respond. I stayed away from negative words like “problem” or “issue” when talking to colleagues and direct reports about my plan to change my gender expression and used words like “realization” and “recognition,” instead. I wanted to make clear that I had made a decision I was happy about and that I was looking forward to being the same co-worker I’d always been, only with a new outward appearance. My own situation was different from many because of my senior management rank, of course, but I think it also helped that I was willing to bare my soul a little bit. I basically said, “Here’s what’s been happening with me…” that included my then-recent divorce and my decision to finally live as my true self. If you show some vulnerability, people will often respond more warmly than you expect. Q. You write that one pitfall of returning to work after a transition is the feeling that your career has stalled. What can you do to regain traction? A. Unfortunately, I’ve heard of too many trans people who remain with their employer yet find that their professional development slows down or stops. Sometimes, people are passed over for promotions that they’re convinced their skills and experience qualified them for. When that happens, it’s hard not to think that—even if your boss and colleagues seem supportive—your transition has changed the higher-ups’ perception of you and your potential. But, it’s essential to put that aside and try to find out why you were passed over. Ask for their honest feedback on your performance. It’s not always easy to come by because some managers are just not good at giving it, and, in those instances, simply moving to another part of the company and getting a different boss can make a huge difference. If you’re still hearing vague answers, or no answers at all, despite your best efforts, you may want to think about moving on to a new job in a different company. Q. In general, though, after a transition, you encourage people to hang in there? A. At least for a while, yes. It might sound obvious, but the best way to keep your career moving forward is to be a model employee at the job you have right now. Be the same high-performing person you were before. Keep a positive attitude and meet all of your deadlines with top-quality work. Sometimes, it just takes some time and patience to get your career trajectory back on track. Q. What else helped you—and your colleagues—adjust to your altered appearance? A. Try not to be tentative about your new outward gender. At first, I had very little confidence about it, and that may have affected how others perceived my work performance. Even if you’re unsure of the way you look, try not to show it. Acting confident—sitting up straight, making eye contact, “leaning in” in meetings—will bring others along and will eventually change your own perception of yourself. Q. Transitioning At Work is packed with resources for people seeking information about every facet of the transition process. What do you hope the book will accomplish? advantage to be truly inclusive and supportive. Lots of research shows that when people can be their authentic selves in the workplace, turnover goes way down, and productivity goes up. What employer doesn’t want that? The second group is co-workers and managers of people who are transitioning. That message is simply that transgender people are just people. They’re still the same as they always were, only happier and more productive because they’re finally living their true identities. And of course, I want to reassure transgender people themselves, who may be on the fence about transitioning. To them I say, you’re doing the right thing. Go for it. Every job seeker, regardless of how you identify, deserves to be treated with fairness, dignity, and respect in the workplace. Want to know where you'd be a good fit? Join Monster today. As a member, you'll get career advice, job search tips, and employer info—including lists of companies that score high for upholding certain values—sent directly to your inbox. Everyone should be able to find gainful employment—and we’re here to help.